Okay! Musume Time: A Young Mermaid's Love Song - 'Seishun Mermaid' Single Review! 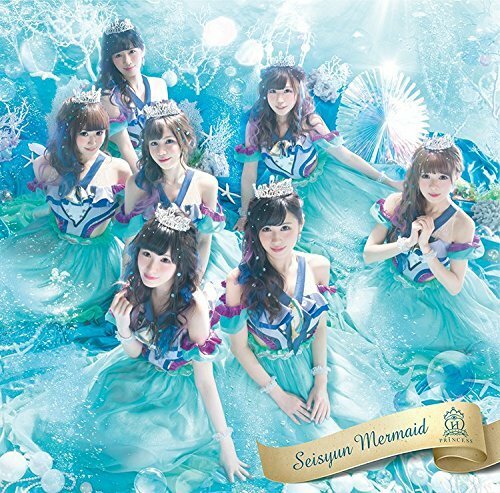 A Young Mermaid's Love Song - 'Seishun Mermaid' Single Review! All thoughts written within this post are my own. That is how it will be, forever and always. Don't try and change my opinion, just because it does not meet yours, kay? That goes for any and everyone, not just me, Got eet!? Released at the tail end of June, Houkago Princesses latest summer single, Seishun Mermaid, is sure to make a bit of a splash with the fans thanks to its catchy tune and melodic vocals, courtesy of resident Diva-voice Maika, Leader Odagiri Nana and soon-to-Graduate Miyashita Mayuka, who aspires to become a voice actress after leaving the group. Containing two new tracks, the single features two bittersweet love songs befitting of a Mermaid's one-sided love with a human, and her desire to walk alongside him, no matter what the cost may be. As this single is based on what was my favourite childhood movie, as well as one of Hans Christian Anderson's most beloved fairy tales, you might have already gathered that I was READY FOR THIS. I've been waiting impatiently, wanting to hear the full audio in clear, beautiful studio quality after I watched the girls introduce the feature track on SHOWROOM LIVE. I was also waiting for the full MV to come out with much anticipation and impatience, of course, because IT IS HOUPRI, and right now, their videos get better with each release, so of course I wanted to see it! It wasn't what I expected, however it still blew me away. So, yeah, I was happy to have finally seen it. And now, I have finally heard it all, crisp and clear, and I'm in love. I am so on love with this, because it's HouPri, because it's a story, and because it's feeding my childhood nostalgia and giving me life. So, that kinda means we're gonna talk about it, because it's what I do best, and because I have to share this absolute joy with you all! Diving into the world of the sea, let's join these Mermaids of HouPri as they become human girls to follow their destiny! In an upbeat yet bittersweet song of love and desire, will these songstresses of the waves ever find what they are looking for, or will they simply become the foam of the sea? 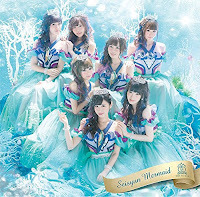 This is a song of a Mermaid in love, and it is Houkago Princesses latest Fairy Tale rendition. Upbeat in sound yet bittersweet with its lyrics, Seishun Mermaid is Houkago Princesses underwater fairy tale that details the love of a mermaid who craves the love of a human from the depths of the ocean. One of the groups most exhilarating pieces you, this has to be one of HouPri's nicest compositions to date, thanks to its tinkling instrumental enveloped with oceanic sounds, as well as Maika's superb vocals, which allows it to truly stand out as one of the groups more unique and satisfying compositions. The way the song has come out is in partly thanks to the talents of Ikoman, the first composer aside from Ishitani Hikari to collaborate with the group. An effort between both Hikari and Ikoman, both composers have created a rather mesmerizing piece that would befit the sea's legendary mermaid princess. The great thing about this song is that, for me, it gets better with each listen. I love the passion and drive it has as a piece, and I adore how exciting it feels, despite how sad but sweet the lyrics can be. I find Maika to be the reason for this, actually, because of all the members, she is the one singer who can really drive that desire and want forward in her voice, making you believe that this song is from the depths of her heart, and that she means every word. You can really hear and feel how much she loves this song and what it means to her. This song is basically perfect for Maika, and though it's basically a duet between her and Odagiri Nana, you can't actually fault management for choosing her as the lead. It's a song about the iconic Mermaid Princess, a Mermaid known for her beautiful voice and talent in singing, so it'd be a bit stupid just to hand over to, oh, I don't know... Odagiri Nana? Aside from the fact one of HouPri's poorer singers got a good chunk of the lines (hmm...), it's still a really good song, though Nana's voice could grate on your nerves a bit, depending on how much poor singing you can handle. What surprised me, though, was that Mayuka didn't get a better deal of lines, because whilst her voice is a bit weaker as of late, she is still the second best (in my opinion, best, cause she has flexibility in range, whereas Maika kinda doesn't), and her vocals are still far superior to Nana's. Also, it's kind of her final single, so... yeah. Where dem lines at, yo!? Honestly though, I like this song. It's energetic, passionate, and thanks to Maika's stellar performance, it's also hella powerful at times. I like the energy and drive she has throughout the song, and I just all around love how it turned out. It's a beautiful piece that is befitting of summer, and perfect for those who love a mermaid's song, and the story of the Little Mermaid herself. Written and performed by the self-proclaimed Diva herself, as well as composed by Ikoman, My Love Song (or: Mai Ravu Songu) is the first solo piece by Maika as a member of Houkago Princess, as well as the first song in the groups history to be written by a member. A long-awaited solo release, My Love Song is sure to meet the expectations set by fans, and will surely please all who hear it. Now, whilst I'm a little bummed out that the coupling song is a solo for Maika, as opposed to a group song featuring Mayuka or, heck, even another solo for Mayuka before she gives her final curtsy, I do get why they gave Maika a solo; she's sure to be in the group for a while after this release, and she's their shining star, right now. That said, the A-side is basically all her and Odagiri Nana, so, why a b-side? They could have easily saved it for an album release, much like they did with Naniro Photograph. It's a bit of an eyebrow raiser (at least, it was for me) when it was revealed the coupling track would be Maika's first solo... I gather it's because it's the Mermaid single, and Maika kinda really freakin' loves Ariel and The Little Mermaid, so they probably did it for her love of the single. Doubt they'll do that for the other members, though, given most of them can't hold a tune as well as Maika can. ANYWAYS, going off track a bit... this is a good song. Much like Seishun Mermaid, it contains a few oceanic sound effects such as waves to give us listeners that sea-like presence, allowing us to feel like we're standing on the rocks alongside Maika as she sings. Unlike the title track, however, this song is a ballad, though it still follows the pattern of being a bittersweet love song. In a way, I like to think of this as a follow-up song to Seishun Mermaid, or the tale itself in general. It's a somewhat emotional piece about love and rebirth, all the typical things you'd probably find in a generic song about one-sided love, and Maika did it well. It's a good solo, and I'm glad that it's a solo that was penned by Maika, rather than someone else. There is emotion here, and there is passion, and the only thing I'd say is holding her back is her lack of vocal flexibility, but honestly... I doubt anyone but myself cares, because Maika is a good singer, and this is a good song. I just kinda wish it had been a group affair, rather than a solo, because I wanted Mayuka to have a nice goodbye. We can't have everything though, now can we? Houkago Princess are doing really well right now. Already on their 10th single release (overall), they're doing really well, especially with this niche Princess dress-up gimmick they have going on. The group is at its strongest yet, and with each new release, they just continue to get better in sound, look and video. Seishun Mermaid is proof of that, thanks to its beautiful visuals and gorgeous sound, and honestly, this is a great single to listen to, especially if you prefer quality vocals over everything. For me, it just makes me happy that they're churning out different sounds with each release, going from cute to cool, romantic to bittersweet, and everything in-between. They are not a group to shy away from a change of pace or tone, and that makes me super happy as a fan. What makes me even more delighted, however, is that this single sees all members receiving lines, because daaaamn, it took some time! It's a treat of a single, and if you like Princesses, dress-up, mermaids or Idols in general, then this is something that may just tickle your fancy, because HouPri are fabulous! Seishun Mermaid is great, in my opinion, and HouPri are only getting better. It's a single that has a great leading track, and a nice b-side to calm things down when Seishun Mermaid gets too bubbly for even my own liking. It's one to dive into, and allows us all to appreciate the majestic beauty that is Maika's voice, in all its powerful, passionate glory as she sings about the sea maiden we grew up knowing in both stories and on the screen. From the "Impossible" into "Ariel"
It's fun, it's great, it's a treat and a splash. Will these Princesses steal your hearts with their voices, or their beauty, and will you become besotted by the siren's voice? Updates In Life: Travelling I Go... Again.